Members of the Fiji Airways Fijian 7s team celebrate a try during the game against Japan at AT&T Park. 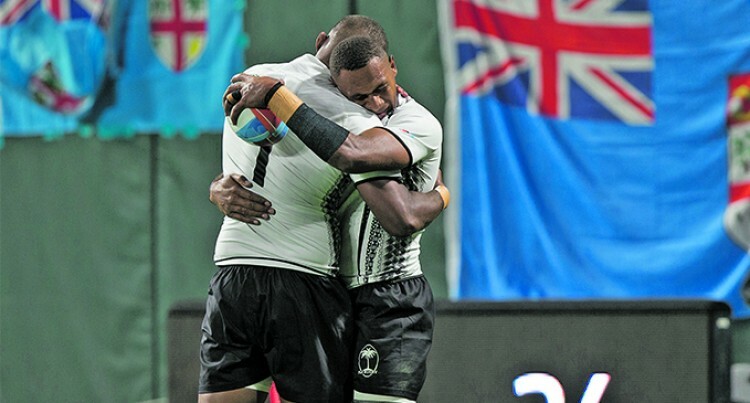 The Fiji Airways Fijian 7s teams can’t afford to slip again at the Rugby World Cup Sevens. The team must deliver today and tomorrow in San Francisco or 2018 will be wasted. We fell short twice-at the Commonwealth Games and the World Sevens Series-and this is our last chance for a major Gold Medal win for this year. We can’t afford to choke again at the final hurdle and we can’t settle for second best. It has been a long 7s season where we have achieved so much claiming five tournament wins in the World Sevens Series. It has been a superb season, but after settling for silver medals in Gold Coast and Paris, the Gareth Baber-coached side must return with the Golden gong to make it a memorable one. Losing the final at the Commonwealth Games was understandable in a sense after coming off a heavy schedule. But, for the RWC 7S, the team has been given ample time to prepare. Training at Salt Lake City, Utah for two weeks. Since the 2016 Rio Olympics gold medal win, Fijians need to start winning overall competitions rather than tournaments. Fans will definitely raise questions about our players’ ability to stand up and be counted when push comes to shove. We definitely have the players to do the job and they showed their class in the game against Japan. They were tested by the Brave Blossoms and survived coming out 35-10 winners after trailing 7-10 at halftime. It’s just what the players need to set the pace. It was a great effort because it was the first time for all overseas based-players Leone Nakarawa, Josua Tuisova, Semi Kunatani and Semi Radradra to play together with the rest of the players after the 15s season. Another positive outcome from the game was there was no cards issued against the team and our tackles were effective 20/9, tackle completion rate: 74%/ 47%, errors made: 3/3, turnover lost: 1/2 , set piece ball won: 4/ 9, restart ball won: 1/ 1 rucks and turnonvers won: 4/ 13. We can only get better from today playing in a format which offers no second chance. Because of dominance on the global stage, Fiji wants the Melrose Cup more than any other team. The best that fans at home can do is pray for the team. We need the World Cup to cap off what has been a testing season.